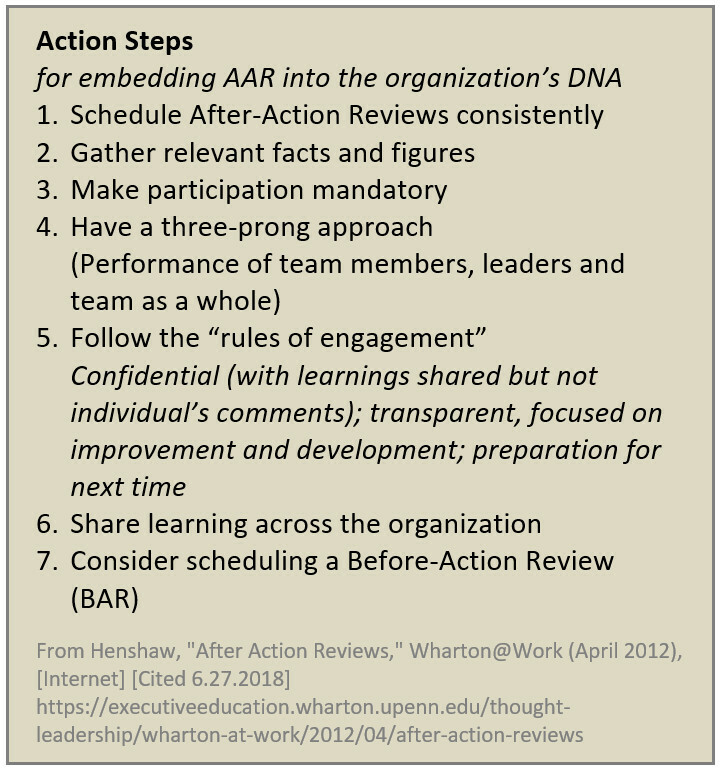 “The After-Action Review (AAR)… was conceived back in 1981 to help Army leaders adapt quickly in dynamic, unpredictable situations they were sure to face2.” And, I cannot imagine a more important environment for learning than when you and your teammates’ lives are on the line. The Army and the Marines both have extensive investment in training individuals (partially through informal AARs) and the organization as a whole (partially through formal AARs). Although the different branches have some unique nomenclature, for example USMC’s Lessons Learned Report, the objective of learning and improving quickly is consistent throughout. Most of us only rely on our teammates for our lives metaphorically, but individual and organizational learning can occur the same way- through an After-Action Review (AAR). We think of learning (e.g., what is working/what is not working) as the front-half of the learning-innovation coin, with innovation providing the here-are-the-changes-we-make-now side. And, to paraphrase the title of a Forbes article slightly Agile is the world’s most popular innovation engine3, with business agility as the ability to rapidly respond to change by adapting the organization’s stable configuration4. 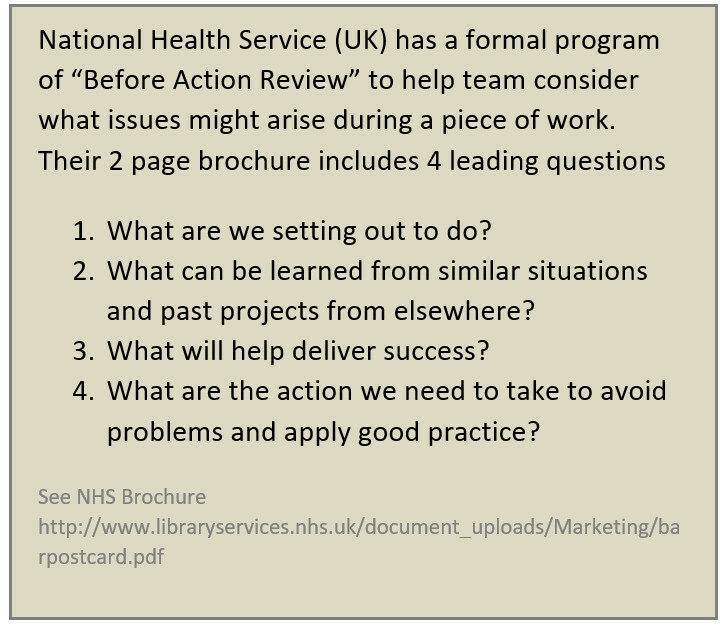 Just to be clear, an action can be a project, activity, event or task5- the work we do- and a potential opportunity to learn. Throughout the remainder of this post, we will link the idea of learning through a facilitated technique for event-based analysis: before-, during- and after-action reviews. Our experience as consultants with post-mortems extends back to our pre-MBA days as engineers. As management consultants, we have mostly relied on kickoff meetings to ensure general communication of the problem and plan, demonstrate leadership commitment, and engage the team. 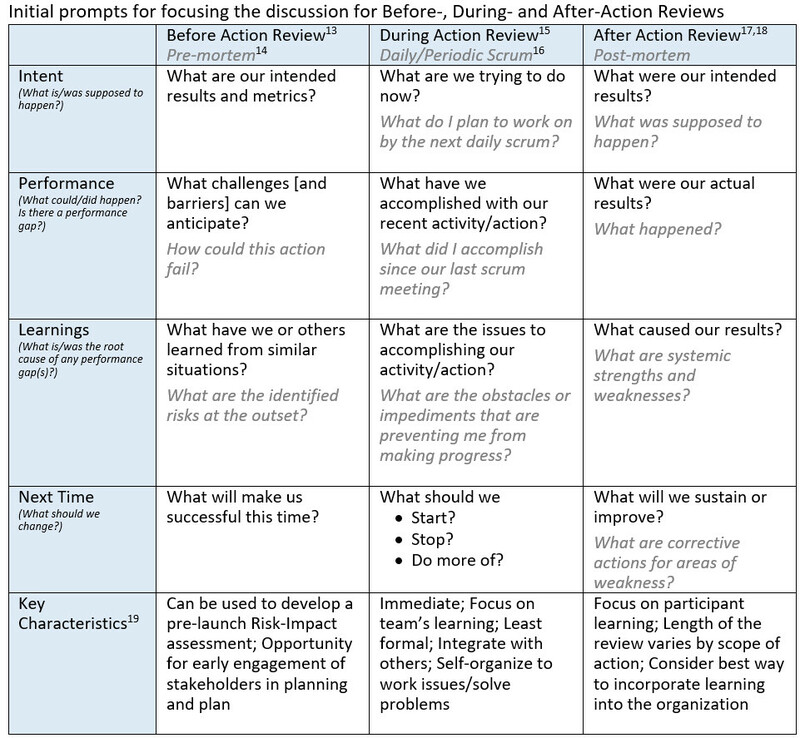 Familiarizing key stakeholders through a Before-Action Review (BAR) is a logical next maturity step in project management, and it prepares the stakeholders and team members for the following After-Action Review discussion(s) with common themes. Early involvement of the team and other stakeholders increases awareness and provides a basis for innovation during execution to improve performance throughout the project, activity, event or task. What did I accomplish since our last scrum meeting? 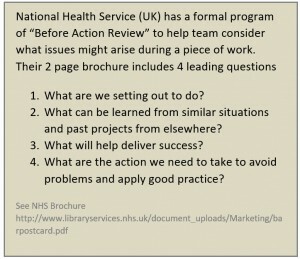 Looking at the Before-, During-, and After-Action Review concepts together, the most popular technique includes discussions facilitated by prompts or questions. The following provides widely-published prompts for each type of review along four common topic areas (e.g., Intent, Performance, Learnings, and Next Time), and we have included some of our observations as key characteristics for each of the review-types. After-Action Reviews by any name are a proven learning technique in business and in the military. 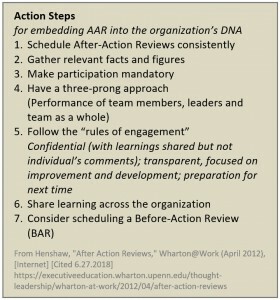 If you take only a token effort from your post-mortem, or if you do not currently capture learnings from your projects to expand your institutional knowledge, start with After-Action Reviews. If you have After-Action Reviews built into your culture and standard operating procedures for most projects, events and activities-of-scale, adding a Before-Action Review is a great next step. After you have begun to appreciate the benefits of learning and innovation of AARs and BARs, and, if you would like to enjoy the widely-published benefits of speed and flexibility of an agile organization, consider taking the step toward a scrum approach to agile by including During-Action Reviews, commonly referred to as the daily standup meeting. Keep in mind, that just like project management, you only need to add enough structure to manage the risk. For example, your scrum meeting frequency can vary, as we have found to be successful with our weekly business initiative SwiftTeamssm team meetings and sponsor reviews. “A pre-mortem in a business setting comes at the beginning of a project rather than at the end, so that the project can be improved rather than autopsied.” See Klein, “Performing a Project Premortem,” Harvard Business Review (September 2007).